In the 1960s, if you were a black person in America, Dr. Martin Luther King was a part of your life. None of us then would have dreamed that, one day, America would honor his birth with a federal holiday. 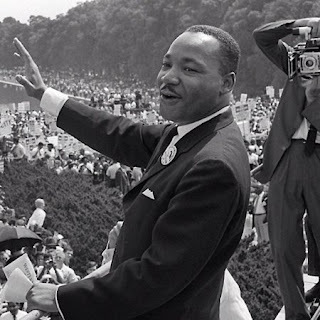 Friends, neighbors, parents and children (no matter how little we were) sat glued to TV sets and watched the live special network coverage of Dr. King as leader and spokesman of the March on Washington. We witnessed history. The 1960s was a decade that was thrilling, turbulent and tragic. There was great hope. There was great sorrow. For my parents, hope was felt when John F. Kennedy was elected the country's youngest and first Catholic President of the United States. Ours was a Catholic household in South Central Los Angeles. Today, many aren't aware of the prejudice Catholics experienced. In my life, the first sting of bigotry I ever felt was not racial and not due to sexual orientation. Those stings came later. It was religious and it happened when I was in St. Leo's Elementary School at recess. A neighborhood kid run up to me, spat in my face and shouted "G_ddamed Catholics!" and then ran off. Classmates stopped playing and stared. Our teacher, a sweet nun, headed towards me immediately. She wiped off my face and then put her arms around me, hugging me. The habit made her arms look like angelic black wings that were wrapping me up to hug away the humiliation and hurt. We had President John F. Kennedy. And we had Dr. Martin Luther King, leader of the now historic March on Washington that took place in August 1963. 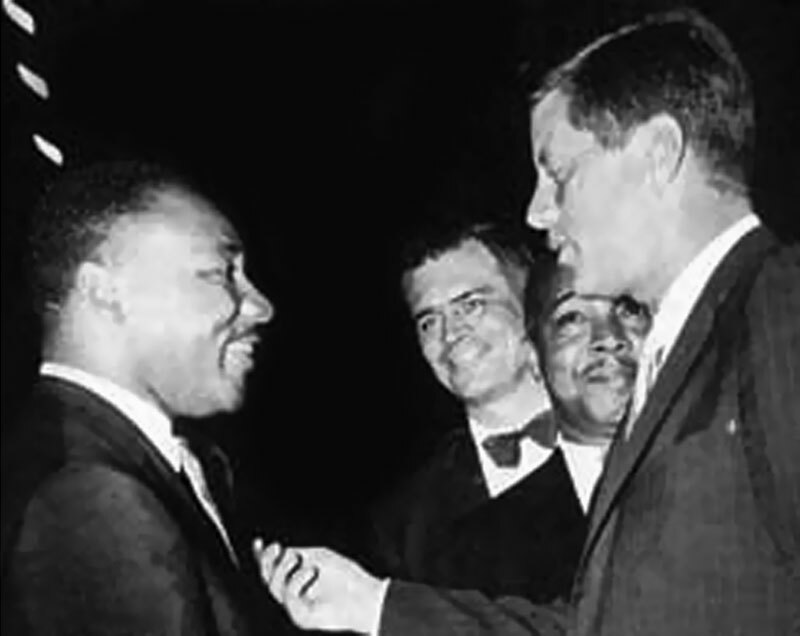 Here's another photo of Dr. King and President Kennedy. In the front row, there's Dr. King second from the left. 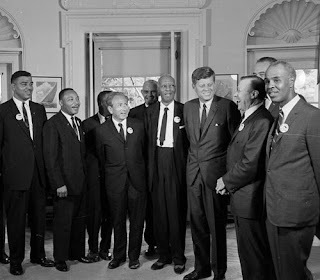 President Kennedy is third from the right. On November 22, a Friday in 1963, our nation was paralyzed with shock and grief when President Kennedy was shot and killed in Dallas, Texas. Dr. King continued his work for Civil Rights. 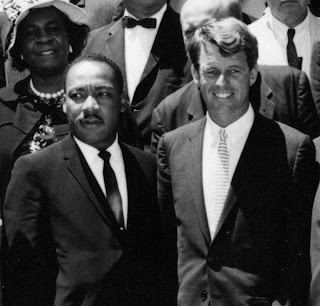 Hope rose again when the late president's brother, Senator Robert F. Kennedy, ran for the presidency and bonded with Dr. King. In previous blogs, I've written about how my parents let me stay up late one week in early 1968 to see The Tonight Show. Johnny Carson was on vacation and asked Harry Belafonte to fill-in for him. Rarely did a black person host a network nighttime entertainment talk show. Look at NBC, CBS and ABC now. It's still a rarity. That February week is covered in the 2011 HBO documentary on Harry Belafonte, Sing Your Song. He had a great line-up of stars that week. Two of his guests...Senator Robert F. Kennedy and, making his first appearance on a late night network entertainment talk show, Dr. Martin Luther King. He was warm, funny and relaxed with his friend, Belafonte. That was February. Watching network and local newscasts was standard family practice in our house. On April 3rd, a news story came on about Dr. King. He was in Memphis to help sanitation workers in their fight for Civil Rights. I happened to be standing in the living room when it came on and my mother walked over to the TV and stood next to me. This was not the relaxed, casual Dr. King on The Tonight Show just a couple of months earlier. Back then, soundbites ran longer on newscasts. They weren't limited to 10 seconds the way they seem to be now. I was a high schooler, a kid, but I felt this intense agitated psychic energy coming from Dr. King. There was something in his eyes during this speech, something prophetic. Again, we witnessed history. When he said "...and I've seen the promised land...," the way he declared the word "seen" was like a great, free note from a trumpet. This was no ordinary speech. It was a passion. A vision. I couldn't move. We didn't move. I couldn't take my eyes off him and I didn't understand the odd emotions I was feeling. After he powerfully and valiantly foretold, "...I may not get there with you...," Mom put her arm around me and softly said, "Listen to him, baby. He may not be with us long." This is what we saw on the news that April 3rd, 1968. 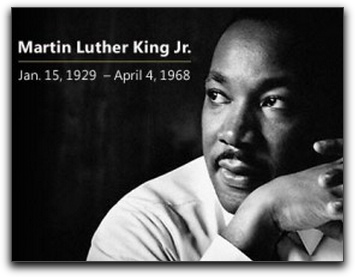 Dr. Martin Luther King, Nobel Peace Prize recipient, was shot and killed the next day, April 4th. My mother was right. He wasn't with us long. That night, April 4th, Sen. Robert Kennedy, got news of the tragedy while he was campaigning in a black community. This too would be on the news. Two months later, in early June, Sen. Robert Kennedy would be shot and killed while campaigning in Los Angeles. The 1960s. Thrilling. Turbulent. Tragic. There was a respectful solemnness on our high school campus amongst students and faculty the day after learning of Dr. King's assassination. Ours was a predominantly black and Mexican-American school. About Dr. King, I thought of a line from a movie I love -- To Kill A Mockingbird. A kind neighbor lady says about Atticus Finch, "There are some men in this world who are born to do our unpleasant jobs for us." In that sense, Dr. King was like Atticus Finch. Today, I still feel that I benefit from the bravery and non-violent protests of Dr. Martin Luther King. I am so blessed to have been young and attentive when he was still a living voice in America. His messages for equality and tolerance and economic freedom, his words, must be kept in action. Wow...wonderful remembrance of Dr. King. Thank you so much for this. Once again, I am so grateful for your attention. Thanks, Joel.